You can wipe those tears away if you missed out the first run of Quiccs x FLABSLAB “Baby Ghost of Kurosawa” as the cute-ish little bugger gets another run! 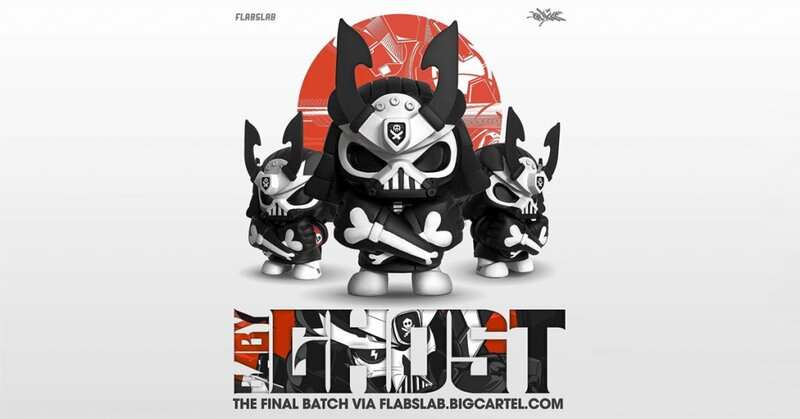 Today FLABSLAB right outta blue announced the time and date of the 2nd round of the pre-order date! Don’t question the cuteness and size, we are told he’s still one sword slinging slayer. First seen as a custom by Quiccs for the custom Skullhead Samurai show by homeboys Pobber Toys, the Baby Ghost makes its return as an edition run. Cast in resin and measures 8.5 inches from feet to the tip of his horns, Baby Ghost certainly needs to grow up soon! In the desolate world of a hundred years after the Third World War exists survivors of our mankind cornered into the shadows, away from the ruling hive-minded race of intelligent machines. Left with only rare remnants of memories from our distant lost civilization, the hidden dwellers find religion in what we consider today as mere popular culture — though in its inner cores of fiction they find hope in the recurring concepts of love, rebellion and freedom, from which champions have emerged to lead the resistances against the oblivion of mankind. The mad men who are sane in the now mad world campaign their peoples’ claim to their right to exist, and from these men manifests one enigmatic ruthless messenger of Akira’s unearthed doctrines of insurrection and vengeance, the man known only as… the Ghost of Kurosawa! Measuring 8.5 inches from feet to the tip of his horns, Baby Ghost certainly needs to grow up soon!